*Youthful skin contains a natural substance called hyaluronic acid (HA). As we age, we lose HA in our skin, causing the appearance of laxity, fine lines, and wrinkles. HA works similarly to a sponge in our skin, absorbing water to create volume and shape. Loss of HA leads to depressions such as the nasolabial folds (smile lines) and marionette lines at the corner of our lips. Juvederm replaces lost HA in our skin, safely restoring our youthful volume.  Juvederm is similar in structure to Restylane, but tends to diffuse slightly more, making it highly effective for plumping the lips. Juvederm is also great for the nasolabial folds or “smile lines.” Like Restylane, Juvederm is mixed with lidocaine for a comfortable injection. In addition, a topical anesthetic is commonly applied for ten minutes to the treatment area. As a hyaluronic acid based product, Juvederm can be dissolved if necessary. Therefore, in the very rare case of unwanted results, patients can request to remove the filler with a simple injection. Side effects with this product are minimal and rare, but include over or under correction, bruising, swelling, lumpiness, and discoloration. Juvederm is available as Juvederm XC and Juvederm Voluma XC. For information on Voluma, visit our Voluma page. Our patients report that results from Juvederm last 9-12 months, on average. This filler is an ideal choice for safe, temporary enhancement of lips and smile lines. Our San Diego facial plastic surgeon and aesthetic nurses are expert Juvederm injectors who have been trained and certified directly by Allergan. Contact our San Diego Medical Spa today to find learn about our latest specials and find out if Juvederm is an option for you!